Line poles are a prominent feature in photos that just stood out to me. 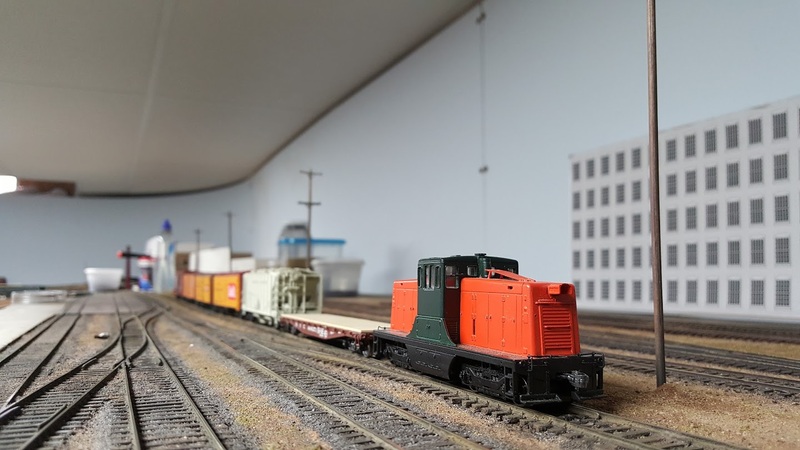 They are also a feature that I think tend to be overlooked on model railroads. Either they aren't present, or not much care is put into their modeling. Like the trackwork, the infrastructure around the railroad is always present, and in every photo you take of that scene. 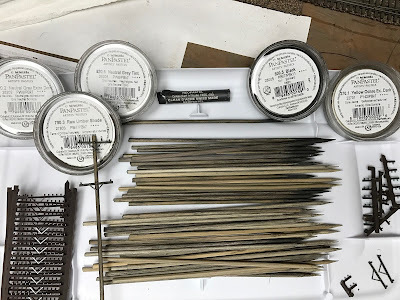 The reality is that you don't have to spend hours on them, you just need to take a closer look at photos and the prototype to better match what you're modeling. Photos of the Highland Line are fairly easy to pick out due to the number of crossarms on the line poles. Like this Tom McNamara shot at Wooster St. (date unknown) of DERS-2c (RS-3) #554 with what looks like a race special or something as I think that's a diner behind the locomotive. I've got links to a few sites that I found extremely helpful in understanding line poles (railroad and otherwise). 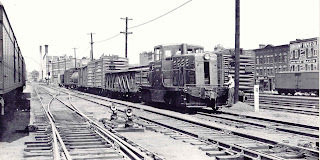 The poles on the left appear to be the same line that runs through New Britain Yard. 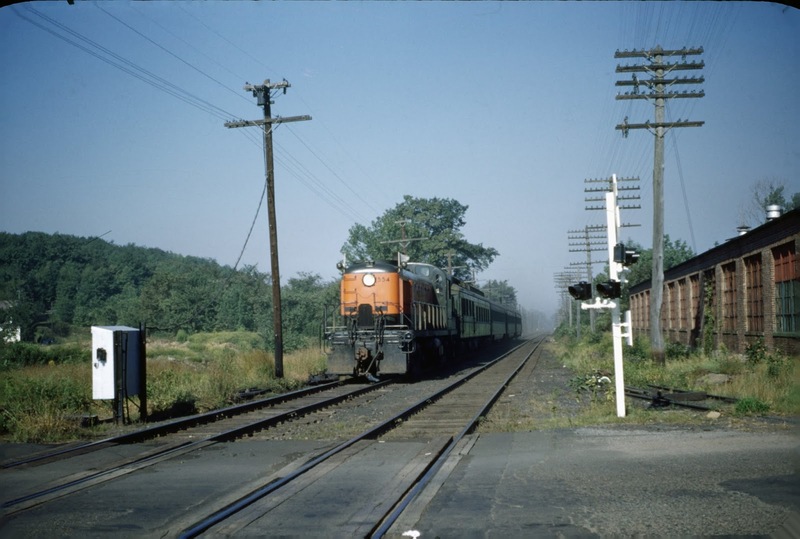 The ones on the right are consistent along the Highland Line, although you'll note that they aren't running through the center of New Britain. I haven't figured that out. They are definitely railroad line poles. 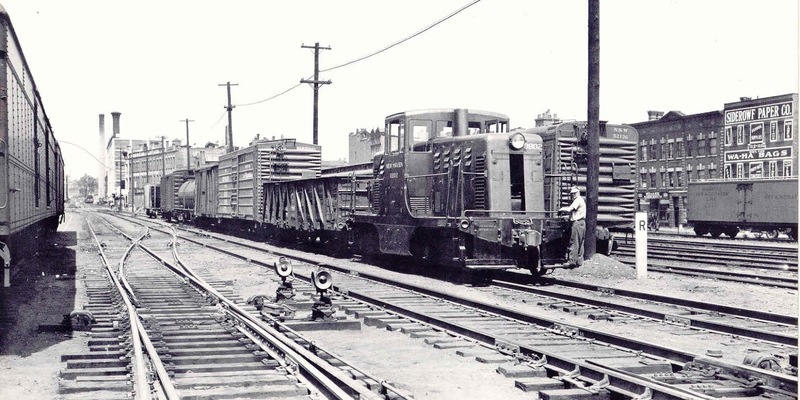 When looking at pictures of New Britain Yard, you'll notice that the number of crossarms is steadily decreasing over the years. This is less so on the Highland itself, although there is one fewer crossarm on the line on the right than in earlier pictures. The line poles are also fairly tall. Since I don't know the actual height, I simply mocked up this scene and a line pole and tried them. I also mocked up a couple of other photographs. The original poles were a bit long, so I shortened them until they looked right. The taller height seems to continue through New Britain. Although it's great to work with specific dimensions, this is also part of the art of modeling. Working with proportions and eyeballing things works very well. You'd be surprised at how good your eye is at estimating things once you have a little practice. In addition to the height, I also worked out a spacing that looked right on the layout. I knew how many poles I needed between Main and Elm streets, I just needed to adjust the spacing to look "right." I'm using bamboo skewers with Rix crossarms. I clip the poles to length first, although they aren't all the same exact length (for gondola loads I'll be more precise). The bamboo skewers I found are a bit thicker than the Rix poles, but they look about right to me. I also don't care for the Rix poles because they are notched for 5 crossarms, and I'm using far fewer. The notches are noticeable, particularly in photos. But other than staining the poles first, these techniques will work fine with Rix or any other commercial line poles. I also experimented with chucking the skewers in my dremel to try to taper them, since the real poles often are. In the end I decided that it was too much work for too little reward. I stain the poles in a mix of black and brown inks. I started with Micromark Railroad and Bridge Tie Stain, and also added some Citadel black and brown inks to the mix. The last batch (which I was using to stain ties) was weak, so I added some india ink. This primarily colors the top of the poles, and soaks in a little to "dirty up" the pole. The ones in the photo below soaked for at least two days. After soaking overnight (at least), I dry them off, then use an oil pastel at the bottom of the pole to give a greasy creosote look, and Pan Pastels to weather the rest of the pole. Some are weathered more to a gray shade for variety, as some line poles fade to a very light gray. However, in the era I'm modeling, it appears the poles were replaced more frequently because color photos show them to be a more uniform dark brown. This photo shows the crossarms being painted on the left, the various Pan Pastels and pastel crayon I'm using, the poles after being stained at the bottom, with others in various states of being colored. The crossarms are first painted with my usual choice of Rustoleum Camouflage spray paint. The insulators are painted with a Citadel or Reaper chainmail paint. I also used this for the crossarm supports. This is a silver paint for role-playing game miniatures (like D&D) that has a bit of black in it. I then use Citadel inks, usually green but occasionally blue or yellow, over the chainmail. The inks are transparent and give it that glass-like look. I then use Pan Pastels to weather the crossarm itself. When attaching the crossarms, I drill a hole through the crossarm and all the way the pole, then mount it with a bit of phosphor bronze wire and CA. The wire acts as a mechanical joint, and also forms a mock bolt. I probably should use a nut-bolt-washer casting, but they are small, and since they are up fairly high I don't think they'll really show in photos anyway. 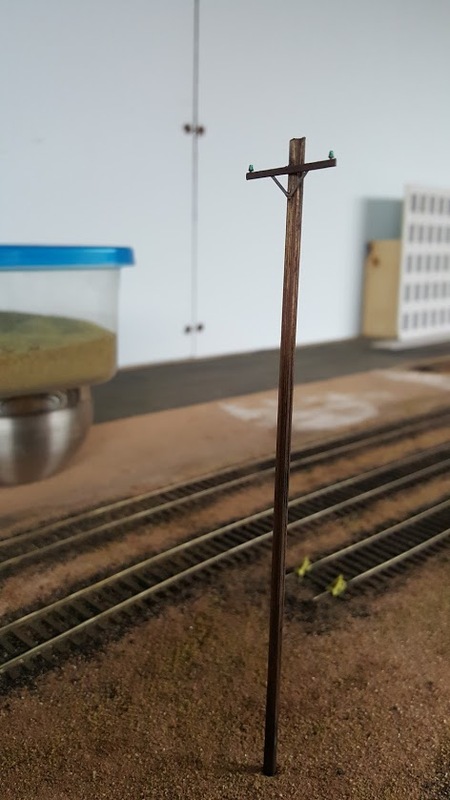 I drill a hole in the layout to mount the poles and leave the bottom pointy to plant them in the layout. That way they are easily removed, and easy to replace if somebody knocks them over or breaks them. Note the differences in color and weathering. I'm also not concerned about slightly warped poles, as that's not uncommon on the prototype. I initially intended to string the poles, but this proved impractical. 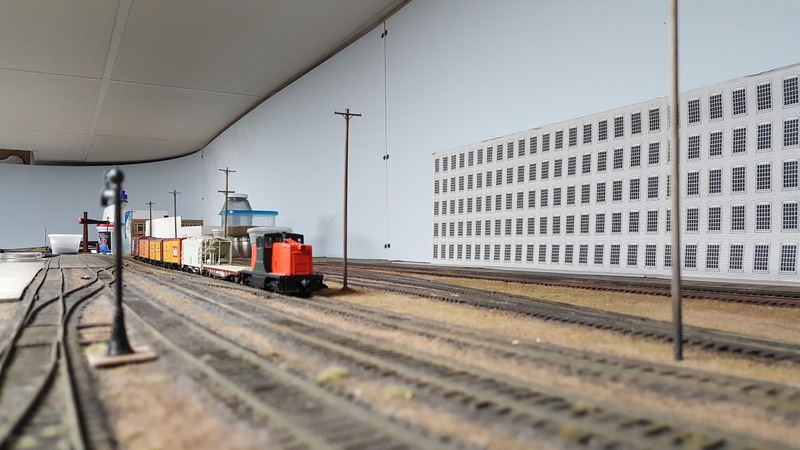 They are along the edge of the layout, and between the mainline and the yard tracks in the yard. The lines were a combination of too low to reach under, and too high to comfortably reach over. Fortunately, the lines themselves are often nearly invisible in photos of the prototype, but it is one of the compromises I wish I didn't have to make. 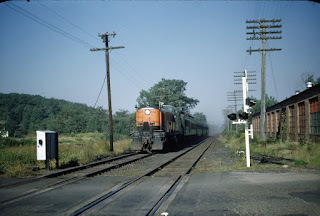 The final post in this thread has specific recollections of NH line poles. Lots of great info and photos, particularly the section on Railway Line Poles. Bill Gill sent me another link he's found: http://www.oldgreypole.com. 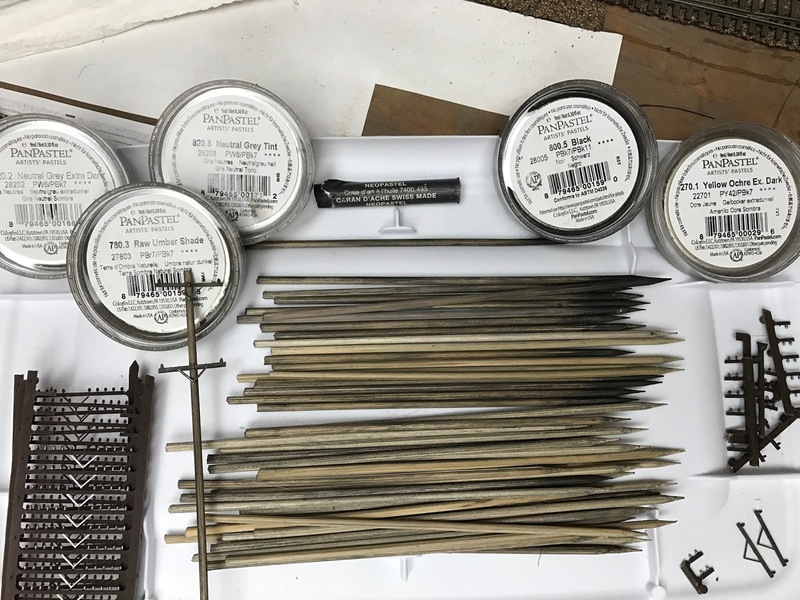 Also, among other things, Lou Sassi has a great article on detailing line poles in How to Build and Detail Model Railroad Scenes. Of particular note is his technique to add a prototypical sag to the lines. 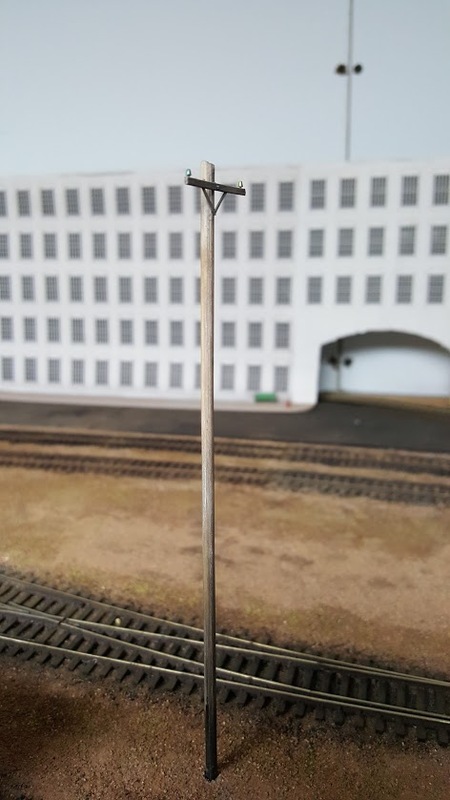 While I determined that I can't really add lines to my poles, straight and taut lines are one of my pet peeves when adding line poles to a model railroad. I find it more distracting than not having lines at all. Yep, I've used that before. Was trying to figure out how to get that prototypical sag with it as well. I might still try it after we run a few sessions with the poles themselves to see how they do.